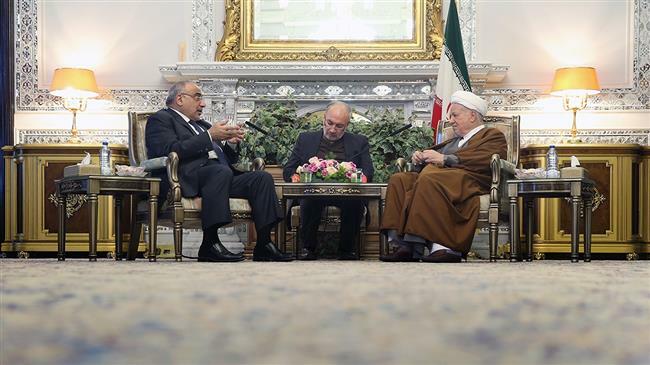 Ayatollah Akbar Hashemi Rafsanjani has praised solidarity among all Iraqi groups in the face of the Takfiri violence plaguing the neighboring country, saying no power can bring such a nation to its knees. In a Monday meeting with visiting Iraqi Oil Minister Adil Abdul-Mahdi al-Muntafiki in Tehran, the chairman of Iran’s Expediency Council said the recent gains made by Iraqi troops and volunteer forces on the battlefield against the ISIL terrorists mark an important juncture in the history of the Arab state. He emphasized the need for unity among all religious groups in Iraq, including Shias, Sunnis, and Kurds, saying Takfiri groups will have no room for terror operations in a country which has an inclusive government backed by people and religious scholars. The Iraqi oil minister, in turn, pointed to the ISIL atrocities in areas under its control and outlined the victories achieved by the Iraqi army and volunteer forces in their fight against the terror group on different fronts. He also highlighted the religious, cultural, and historical commonalities between the neighboring Iranian and Iraqi nations, expressing Baghdad’s readiness to further promote cooperation with Tehran in various spheres. Muntafiki said his talks with Iranian officials would focus on issues related to joint oil wells, petrochemical exports as well as oil prices, which have witnessed a severe slump in recent months.